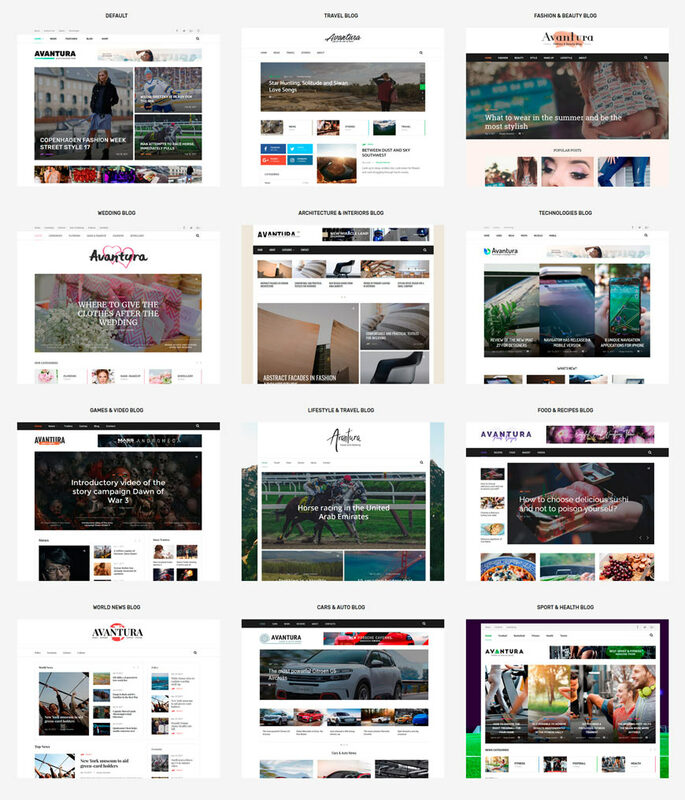 Avantura is a High-quality, stylish and comfortable WordPress theme for creating a quality blog of different directions, including: Travel, News portals, Automotive themes, Fashion magazine, Wedding, Personal blog and many other. It allows you to be in a trend and at the same time can be flexible and functional. Our new WordPress theme Avantura took all the best features of previous projects and became even more perfect and convenient, more functional. This theme has a Drag and Drop Evatheme Page Builder added that helps to easily create different and unique pages. In the Avantura theme there are 12 quality demo sites on various topics that allow you to easily and quickly start your project, you just need to fill the site with your information and photos. As well a large number of ready-made page templates and Home Page pages. When creating pages, you are given more than 4-6 versions of header, more than 5-7 styles of the main slider posts. 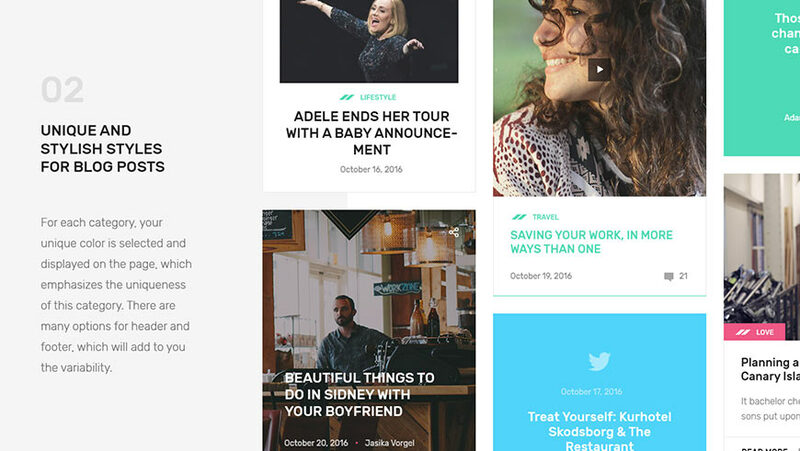 There is a flexible setting of footer and pre-futter, which allows you to do all the most necessary for modern footers from blogs and magazines. What can be distinguished from the features and chips of the theme? – Support for all the latest versions of plugins such as Revolution slider, Instagram Feed, WoCommerce 3.0, Contact form and others. – We have added a very unique function of adding a different color for a different category. Now your each post will be displayed in various colors, it will help your readers to orient in your posts topics. – Built-in EvaTheme Drag and Drop PageBuilder, which allows you to create your own unique pages for the blog, which makes your pages more colorful, more unique and functional and allows more potential and interesting among your blog’s subscribers. We have created this Builder specifically making creating pages more easy, you just need to add a needed element, add your content and save the page. When creating our Page Builder we have taken all the best from Premium Plugin Visual Composer, making it easier and leaving only all the needed for our clients. This allowed to increase the speed of the site loading and simplify the creation of pages. – A large number of variations and styles of posts, sliders, modules with posts, allows you to create various unique pages for your blog and track the attention of users on the necessary records and pages. – The theme is adapted for different languages, so it can be used in different countries and it’s easy to change texts and content. – A large library of free fonts (Google Fonts) will make it possible to make your blog more beautiful and unique. How you can change the style of the blog using fonts you can easily see in the DEMO version of the theme. – Our theme Avantura can use two styles of content displayed, boxed and full full-width. When you choose boxed style you can upload on the background an image or pattern, it will help you make your site more unique with its own individuality. – We use Redux Options to make theme maximum flexibly configurable. With these options you may use additional settings for the whole site (boxed and wide layouts, change of header style, the fonts, major color etc.). 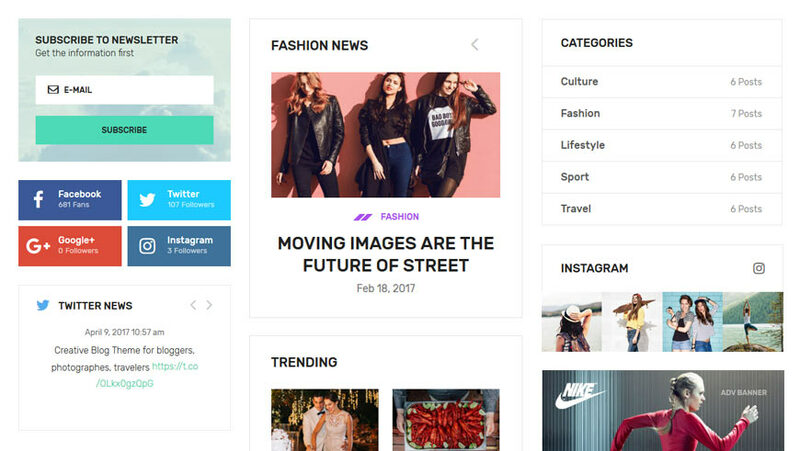 We have created the unique theme, in which we have collected all the advantages of premium themes, we created and included into our theme Drag and Drop Page Builder for maximum easy and comfortable creating of pages of any kind. If you want to make your site modern and most convenient, our theme is exactly what you are looking for.